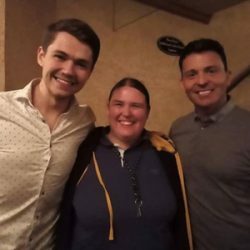 Sarah is from Salisbury, Wiltshire in the UK and traveled solo from the UK to Red Bank, NJ to enjoy a Celtic Thunder Show. 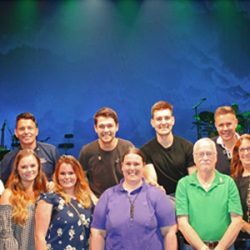 Sarah attended the Celtic Thunder Sound Check, the CTX Show and the VIP Meet and Greet after the show. Traveling solo, Sarah’s journey to the states was going to be new to her, so she wrote the below poem to share with everyone about her experience. Flying solo to see a band I Love so much. Lots of people, worrying at a peak. I carried on to prove to myself I could do it. 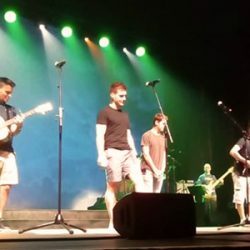 Listing to the band I was going to see helped a lot. Waiting for the airport shuttle in the darkness by myself. It came really late, but I did it, I didn’t let the fear in me hold me back. Who made the journey so many years ago. I can do it, I’m here to see this band I admire so much. I’m nearly there, nerves still jumping up and down. Arrived at the train station so quiet, but not dark this time. Arrived at my final destination my home for two days. My fear is slowly ebbing, people here friendly and kind. Me getting made feel welcome and not so solo any more. 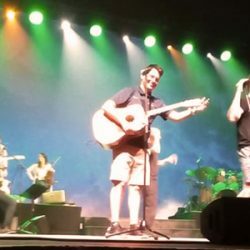 So many songs new and old. Others made me feel really happy. I felt safe I was with a family of sorts. Into the Celtic family with so much kindness and delight. I am here I am happy is my thoughts now. Back to the station, this time did not feel safe. Get me out of here my mind was saying. Just wanted to get home now. Thunder on throughout the night.